Professor Naydene De Lange. This semester, she will be teaching a research methodology course to students in an honour’s program in education, in addition to working on her research on participatory video. Since arriving in Port Elizabeth in January 12, 2013, she has already flown to Durban to attend a training session on teaching the course. On January 23, 2013, in collaboration with Naydene, Vimbiso Makamure (Naydene’s research assistant), Kay organized a photovoice event on campus and invited faculty members and administrators in the Faculty of Education to create photo messages on how to turn the tide on HIV and AIDS and to share the messages with one another. Using a digital camera, each participant created a visual message, combining hand and text in a photograph, on what the faculty can do to turn the tide on the HIV and AIDS pandemic. 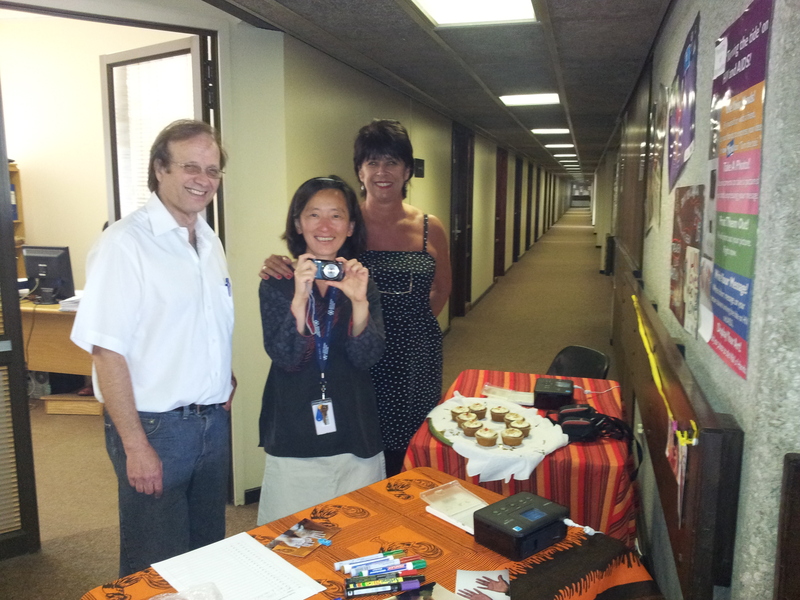 Kay pictured with Prof Paul Webb and Prof Aletta Delport. Kay lives in a Postgraduate Village on campus under the surveillance of monkeys. People in the village (and Port Elizabeth in general) have declared war against monkeys because they tend to steal food and destroy things in homes. Kay also sees mongooses around her house; she is careful not to step on snails on her way to campus; and, looks forward to body surfing in the ocean. Next Congrats to the Winners of the 2nd International Cellphilm Festival!